How do I know you’ll want the manual? First, I know you people. Second, manual gearboxes feel like they’re on the way out on cars like this—BMW doesn’t even bother on the new 3 Series, which is still almost unthinkable–so vote with your dollars if you wanna Save the Manuals. Finally, while the eight-speed auto was fine in the way that every automatic is fine these days, its shifting could on rare occasions be on the less-than-smooth side. Surely, you can do better. The manual also comes with mechanical limited-slip differential and launch control, and is a nice olive branch to enthusiasts, since it signals that Hyundai knows who it needs to please if it’s really serious about taking on the Germans. Further, all of this power still comes with decent fuel economy, or 30 mpg on the highway for the four-cylinder and 26 mpg for the V6, according to EPA estimates. The all-wheel drive versions of both fare slightly worse. Let’s also have a view from a little further out. Yep, still there, right in the middle of what is otherwise a likable face. That reflective cover is hiding the radar system that makes adaptive cruise control and automatic emergency braking systems possible, which: great! It’s definitely a good thing that adaptive cruise control and automatic emergency braking comes standard in the G70, I just wish the design into the grille was a little more seamless. Granted, Genesis isn’t the sole offender in this. Plenty of modern cars have that front plate, and they all look bad, but I need to single it out on this one. This is a small complaint, because the rest of the car is a pure stunner. The car’s infotainment system, like almost every car infotainment system I’ve tested, also has a learning curve, though once I got the hang of it it was mostly fine, if a bit slow. The navigation, however, was plainly bad, as, on long-distance trips, it kept taking me on routes that were less-than-optimal, even after I set it to not avoid highways. In town, this was less of an issue, but when I was in a rush to get to the Charlotte airport lest, it forced me to do what I usually do inside cars, navigation system or not: I used Google Maps on my phone. More automakers should just put Google Maps in their navigation systems, since Google’s dominance of the mapping space seems permanent, or at least has been since people were still getting by on Mapquest. This was also a shame because the voice control feature worked flawlessly in my experience, meaning that I had an easy and safe way of telling the G70 where to go on a screen that was big enough to show me. The space in the back for passengers also isn’t great, especially behind the driver’s seat, if you have the driver’s seat sitting low and to the rear, as I did, since I’m tall and the lower I went the more I felt like a race car driver. Genesis might have been able to find a way to engineer more space, much like like how a good hatchback feels about 10 times bigger than it should, but I also think that if you want more space you should just get a bigger car, like, say, the G80 or G90. If you’re spending $40,000 on a car, you can afford it. How Does It Drive Though? I’ve spent a lot of time here talking about the car’s interior and exterior, which was intentional because a luxury sedan should have a nice interior and exterior, though I don’t mean to neglect the drive experience, which was good in any of the car’s drive modes. The car defaults to “comfort” mode, though if you want to save fuel there’s an eco mode, and if you want to stiffen the suspension and keep the revs high there’s a sport mode as well, as you’d expect. In any mode, the car will give you pep, but it also hugs the pavement around turns with steering that felt firm and stopping power, provided by Brembo, was more than I expected, giving the car a nimbleness and the driver confidence. 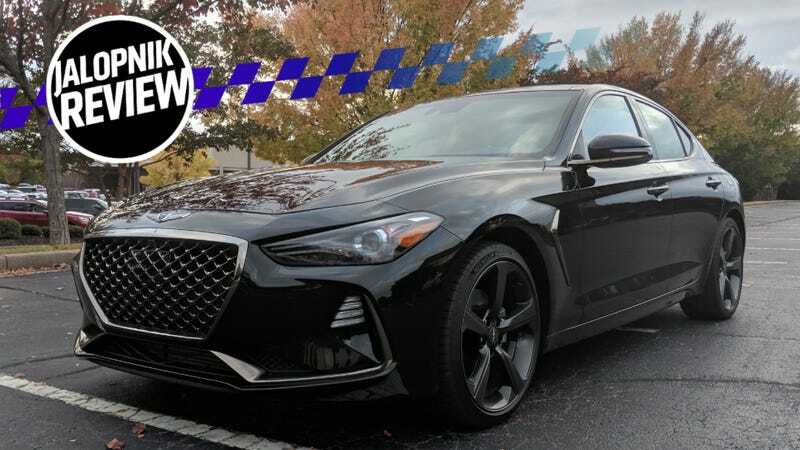 I felt like the G70 could handle anything I threw at it, and the acceleration was such that where I drove it—North and South Carolina, land of American muscle cars—I never felt that it couldn’t go toe-to-toe with almost anything on the street. As I mentioned, I didn’t get to test the V6 version, but my colleague Kristen Lee has. She actually found that she liked the four-cylinder better, since the V6, in her mind, only made the car feel heavier (probably because it in reality was). Like I said, the base price of the G70 is the exact same base price as the BMW 3 Series, but the G70 beats the 3 Series right off the bat with a manual option and, until the newest 3 Series goes on sale next year, more power. Going beyond that, the V6 G70 is lighter than the Kia Stinger, quicker than the outgoing 340i, and cheaper than the BMW as well, but not as cheap as the 400 HP Infiniti Q50. Is the G70 a better value than those cars, though? 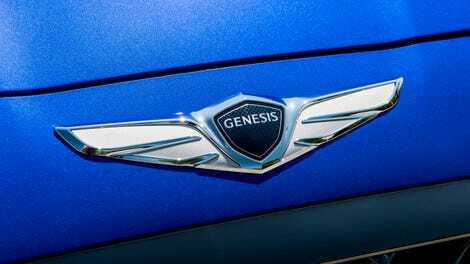 On paper, of course it is, but I suspect a lot of buyers will be put off by the fact that instead of driving a BMW they will be driving a Genesis. To these people, I say drive whatever you want, of course, though the Ultimate Driving Machine is just marketing, remember. People wondered if the Genesis G70 would belong with the group of cars it’s compared to, and I’m happy to report that it does and, in some ways, outclasses the others. I’m only worried that the market is oversaturated with a style of car that Americans are buying fewer and fewer of. I want the G70 to last though, and the Germans deserve the competition. Do yourself a favor and give the G70 a long look if you’re in the market. You won’t regret it. It's a small-ish car, but you knew that! Hits nearly all of its marks.